Animals great and small, friendly and not so friendly appear in these two picture book selections. If You Should Meet a Crocodile comprises twenty-seven poems selected from the excellent Macmillan Treasury of Nursery Rhymes and Poems and feature wild animals exclusively. The emphasis is on the 3Rs of poetry – rhyme, rhythm and repetition – ingredients which make for highly accessible and easily learnt poetry. Thus we have included Grahame’s ‘Ducks’ Ditty’, Rossetti’s ‘The Caterpillar’ and Richard Edwards’ delightful evocation of nightfall in the countryside ‘Littlemouse’, a handful of ever-popular anons and an eight-year-old’s ten word portrayal of a penguin. In both Big Book and standard formats, Currey’s watercolour illustrations orchestrate rather than dominate the words and the moods these create. Care has been taken to make the print easy to read in both versions by using generous leading and font size, and with bold type used for the Big Book format. The latter also has a final page of teachers’ notes written by Pie Corbett with ideas for shared reading, discussion, word play, poem specific suggestion, and other ways to extend the material. 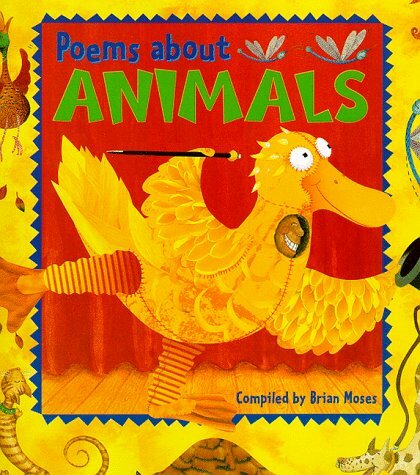 Moses’ compilation of nineteen contemporary Poems about Animals including his own ‘Granny Goat’ and Colin West’s ‘Geraldine Giraffe’ (also featured in the Macmillan book) has both colour photographs and bright bold illustrations. The latter, by Kelly Waldek, depict almost all the animals – beetles, a tarantula, cats, dogs, rabbit, zebra, elephant, mole with wide toothy grins giving the impression that all the poems are light-hearted and humorous and leaving no room for the reader’s interpretation. A final ‘Further Information’ spread includes notes about the poets, ideas for teachers (publishers seem to think that with the advent of the Literacy Hour we have all lost our ability to think for ourselves) and some suggested additional reading.